Industrial Electronic Services Limited is committed to providing a professional, competitively priced high quality service to all our clients. To maintain this level of service we believe in working closely with all our clients to fully understand their objectives, goals and requirements. To meet these requirements we are dedicated to the continual development of our employees and working practices, utilising or developing the latest technology and working within the BS EN ISO 9001 quality standard. IES was founded in 1997 by its current directors Mick O'Hare and Mark Brown after working together for 12 years as senior electronic engineers at GKN in Birmingham. With the objective of providing a range of professional quality electronic services to industry, we have grown to become one of the most successful independently owned companies in this field. We have substantial experience and repair facilities for equipment for all types of industry, specialising in the repair of CNC machine tool drives and controls by manufactures such as ABB, AEG, Baumuller, Bosch, Charmilles, Cincinnati, Contraves, Control Techniques, Danfoss, Digiplan, EMA, Eurotherm, Fanuc, Fuji, General Electric, Hitachi, Honeywell, Indramat, Infranor, Jay, Landis, Mitsubishi, Norwin, Okuma, Reliance, Seidel, Sick, Siemens, Sprint, SSD, Telemecanique, Thorn, Toshiba, Yamabishi and Yaskawa. Such equipment includes: Amplifiers, Interface Boards, Chargers, CNC Controls, Converters, Encoders, Input/Output Cards, PLCs, Safety Light Guards, Soft Starts, Thyristor Units to name but a few. 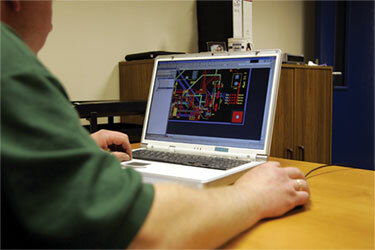 The company also provides a fully comprehensive electronic design and manufacture service, from project conception to full production manufacture, and has the technical expertise to provide viable design solutions for varied engineering problems. Our purpose built 4,000 + sq ft premises is based in the heart of England near Birmingham enabling us to easily serve the UK industry, as well as our worldwide clients. All work is competitively priced and completed in a short time scale giving our clients a cost effective design, manufacture or repair solution.